The wastes of the modern Fallout games are rife with adventure, intrigue around every corner, and plenty of interesting people to befriend. Or shoot. It's easy to get swept up in the desolation of Fallout 3, the whimsical immersion in Fallout: New Vegas, and the sense of discovery in Fallout 4, but it's even easier to overlook the fact that the wastes are home to many stories, and not all of those stories are particularly savory. Here are some of the strangest, creepiest, most unnerving stories that the wastes have to tell. Steel yourself and pray that your Power Armor has a biological waste disposal system, because things are about to get weird. If you've played Fallout 3, chances are that you've explored the heck out of that map. If so, then you might have run across a location called the Dunwich Building. Fans of H.P. Lovecraft might notice the reference to The Dunwich Horror, which is part of the Cthulhu mythos, so one might already expect to find some otherworldly, maddening shenanigans. Upon entering, you're greeted by corpses and a surprising number of ghouls running amok, with the occasional Glowing One threatening to relegate you to the past tense. Deep in the building is an entrance to an older part of the ruins where players can experience supernatural phenomena like flashbacks, doors that open by themselves, and disappearing objects. Also, there's an obelisk being worshipped by ghouls with a woman climbing out of it. So yeah, have fun with that noise. The McClellan Family Townhome seems to be a reference to a Ray Bradbury short story called "There Will Come Soft Rains", which, funnily enough, has to do with a robotic house that still tries to perform its duties, not realizing that its family has died because of nuclear war.Only three of the McClellans are accounted for, which are the boy, Muffy the dog, and a Mister Handy. You can have the Mister Handy unit perform its duties, such as walk Muffy, pick up groceries, read a bedtime poem, and patrol the grounds. If you choose to have it walk Muffy, it will hover over to the corpse of the dog outside and try to get it to stand instead. Eesh. If you have it read to the kids, it will recite the poem to the dead child, seemingly unaware that the baby's missing as well. Yikes on bikes, guys. When wandering through the deserts of the Mojave Wasteland, you wouldn't really expect to find an overabundance of greenery. But after finding and entering Vault 22, you might change your opinion. Inside the vault are weeds, vines, and other examples of flora. Some of these plants are carnivorous, and will actually try to kill the player. Yep, Vault-Tec was trying to experiment with plants and accidentally created a fungus that was toxic to humans, with spores that mutated them into monsters. An oasis in the Mojave Wastelend, this is not. In what is probably one of the best pieces of DLC that any Fallout game has to offer, Dead Money offers players a vacation in Sierra Madre, a glittering jewel in the desert and the creepiest casino you'll ever witness. You wake up in this city of death with a bomb collar around your neck. Sounds fun already, right? This means that someone is holding you tight with a very short leash, and that someone happens to be Father Elijah, a shadowy man who tasks you with gathering a crew in order to pull off a heist, deep within the bowels of the Sierra Madre. What makes this part of the game so creepy and disturbing is the overall atmosphere, which gives you the feeling of being stuck in a city of death. It also happens to be full of deadly gas clouds and is inhabited by nearly invincible ghosts. With the constant threat of death literally looming around every corner and traps everywhere, Dead Money makes for a very intense gaming experience. Oh, man… the Pickman Gallery. We're just going to cut straight to the chase: this is probably the most "nope"-inducing place in all of the Commonwealth in Fallout 4. The house is made up of three floors and each one is a doozy, full of mangled corpses and blood splattered everywhere. As you make your way through the basement, past the various chopped-up body parts, you'll come upon a group of raiders attacking Pickman himself. It's clear from all of the bodies and buckets upon buckets of blood everywhere that Pickman is some deranged serial killer, so you can either leave him to his fate or rescue him. If you choose the latter, he'll gift you with a key that opens up a safe containing a named weapon called Pickman's Blade. Just be informed that if you save him, you'll have saved a creepy murderer who paints with the blood of his victims. The Dunwich Borers in Fallout 4 is more or less a sequel to the Dunwich Building from Fallout 3. If you decide to travel to this godforsaken place, you'll find what looks to be an ordinary quarry. Sure, it's full of ghouls and traps, but if you can manage to clear it, you can enter an underground portion that houses something… paranormal. Sounding familiar yet? The prize for getting through another set of supernatural flashbacks and armies of ghouls is a nifty weapon called Kremvh's Tooth, which is located in a pool of irradiated water. It should be noted that this weapon was used as a sacrificial knife and is also another reference to H.P. Lovecraft. And, as a word of warning, try not to enter the pool while wearing a suit of Power Armor, because it'll sink to the depths of the pool and become irretrievable. Now we come to Vault 11, otherwise known as one of the most savage of Vault-Tec's vaults. It should be common knowledge by now that every vault set up by Vault-Tec also doubled as an experiment of sorts. What makes Vault 11 fascinating was that it was a social experiment that tested out the inhabitants to see what they'd do when told to sacrifice a fellow vault-dweller every year. Refusal to pick an annual sacrifice would result in the extermination of all vault-dwellers. When you enter the vault, you find four dead bodies lying on the ground by the entrance. As you delve deeper and deeper into the vault, you can unravel the mystery about the bodies and find out the full story. You eventually find out that by the time everyone decided to stop with the sacrifices, only five people were left. 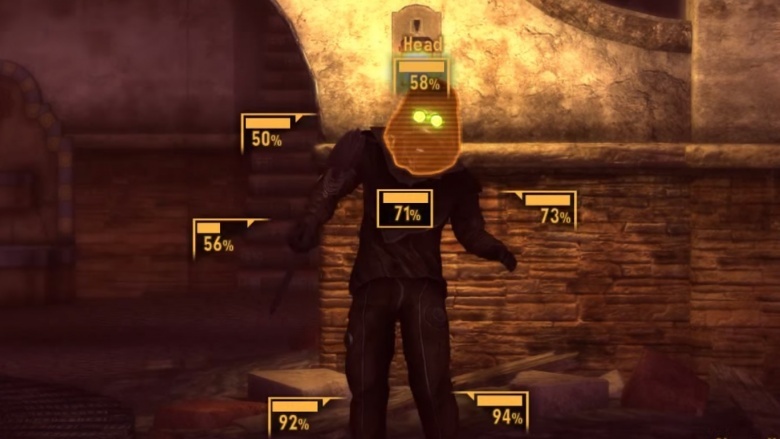 Four of them agreed to kill themselves and to bury the secret of the vault with their deaths, but the fifth one decided otherwise and shot the other four before fleeing into the wastes. And that, friend, is why you discover four corpses at the entrance.